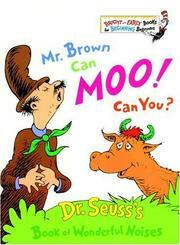 Children's Picture Book Database at Miami University | Mr. brown can moo!Can you? Mr. brown can moo!Can you? Mr. Brown does many things and always asks if you can do it too. He makes many noises like animals. Can you?Mr. Brown can do everything. Seuss, Dr., “Mr. brown can moo!Can you?,” Children's Picture Book Database at Miami University, accessed April 25, 2019, https://dlp.lib.miamioh.edu/picturebook/items/show/10059.